Hudson Yards rising on the Hudson River waterfront. Progress continues at Hudson Yards' first phase at the eastern rail yards, with work progressing on all sites. When complete, the 28-acre site will be the largest private real estate development in the history of the United States, and the city's largest since Rockefeller Center in the 1930's. 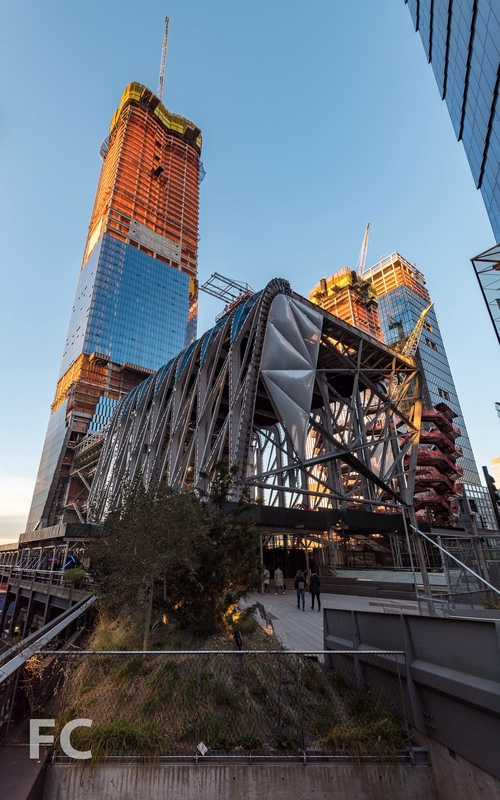 Steel superstructure continues its rise at the second office tower, 30 Hudson Yards, at the northeastern corner of the rail yards. Designed by KPF, the 92-story, 1,287-foot tower will house Time Warner Inc. and feature an open-air observation deck. Northeast corner of The New York Times Building (left) and 30 Hudson Yards (right). 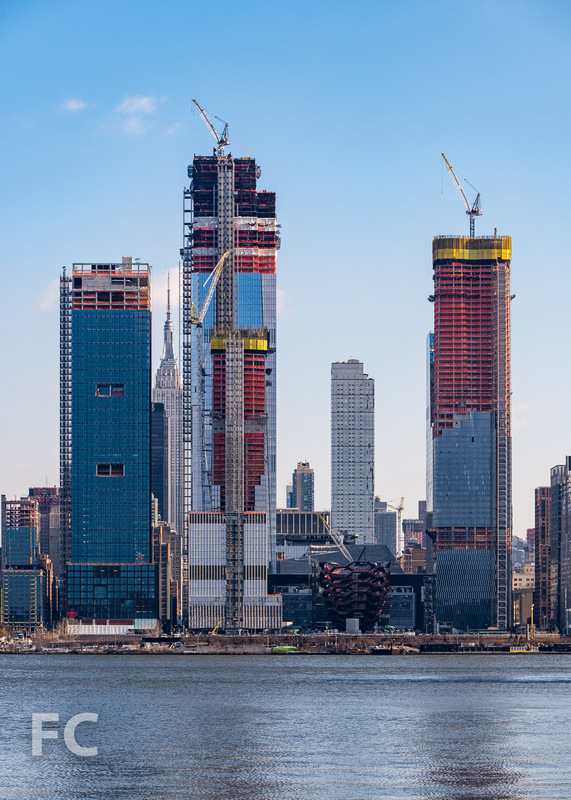 The first residential tower, 15 Hudson Yards, continues to make progress as its concrete superstructure rises towards its final height of 900 feet. 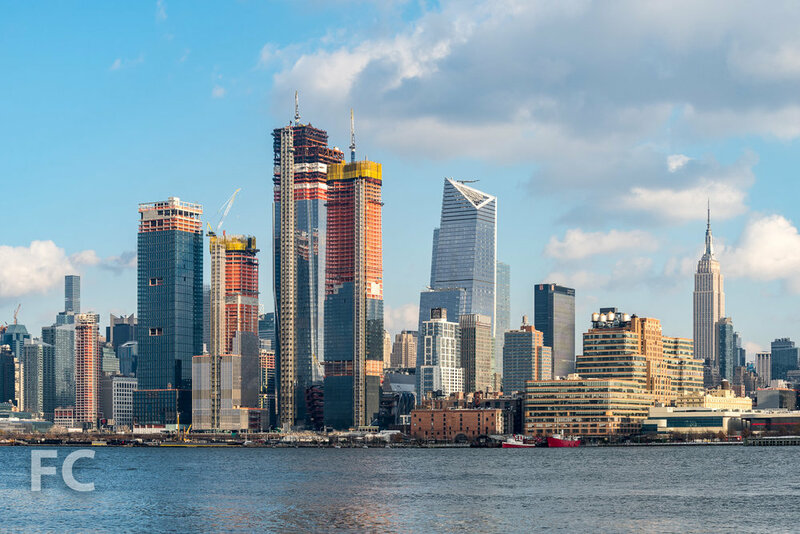 Designed by Diller Scofidio + Renfro in collaboration with Rockwell Group, the 70-story tower will offer both condo and rental units. Sales for the 285 one- to four-bedroom condo units are underway. West facade of 15 Hudson Yards from the High Line. Close-up of the northwest corner of 15 Hudson Yards. 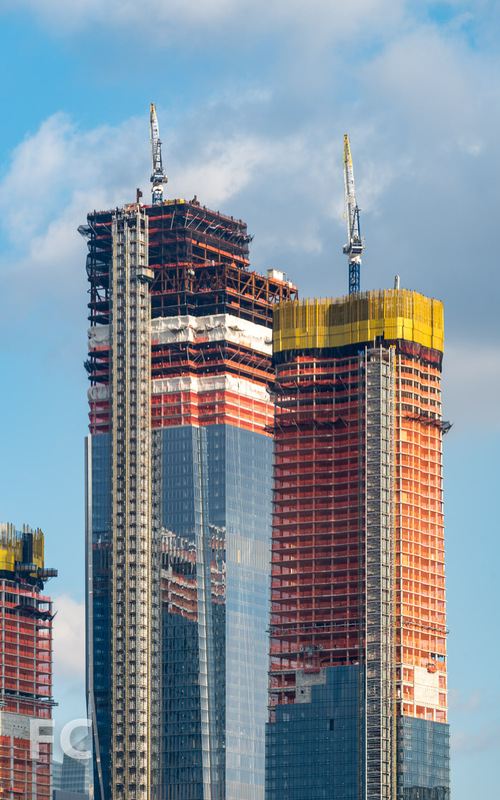 Close-up of 30 Hudson Yards (left) and 15 Hudson Yards (right). 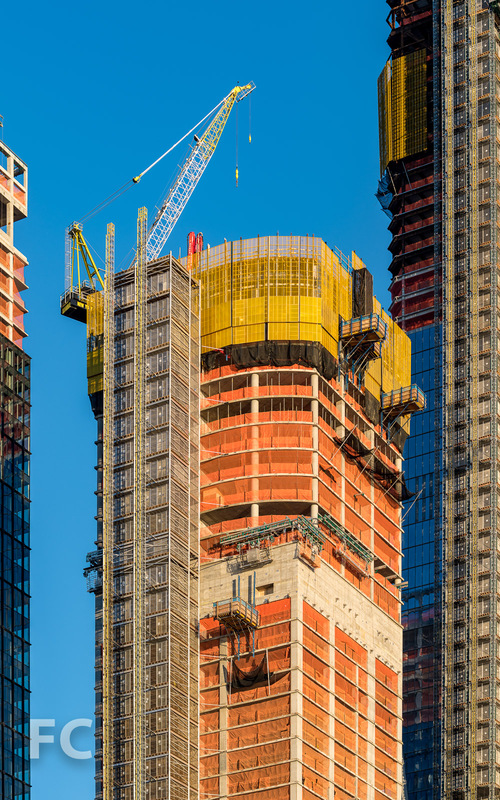 Superstructure is rising at 35 Hudson Yards, a 72-story mixed-use tower designed by SOM. 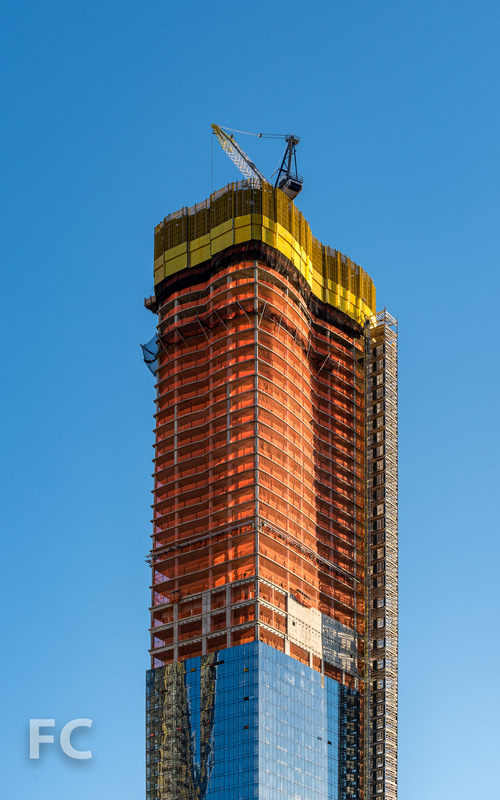 At its final height of 1,000 feet it will be Hudson Yards' tallest residential building. The 1.1 million square-foot tower will include 137 private residences, an Equinox branded luxury hotel, an Equinox fitness club and spa, first-class office space, and ground-floor retail. Limestone and glass clad the exterior of the tower. Southwest corner of 55 Hudson Yards (left), 35 Hudson Yards (center), and 30 Hudson Yards (right) from the High Line. Close-up of the southwest corner of 35 Hudson Yards. Close-up of the northwest corner of 35 Hudson Yards. 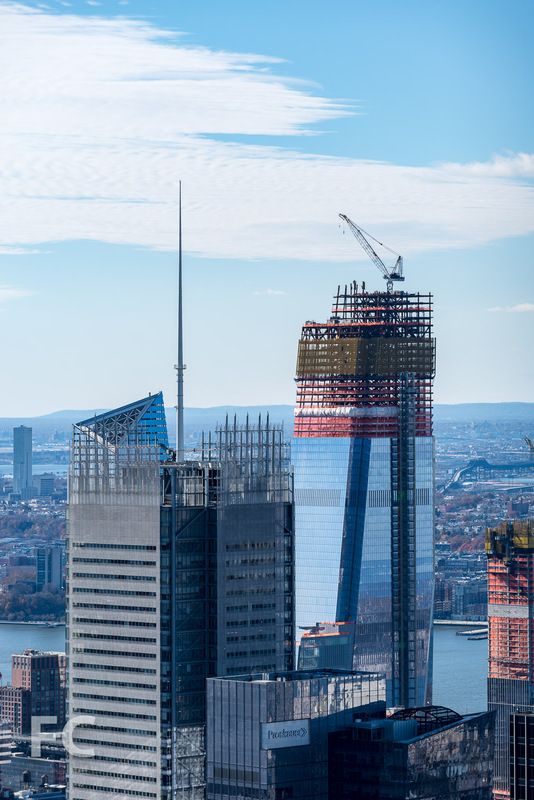 Installation of the exterior wall is nearing completion at 55 Hudson Yards, the Related Companies office tower at the corner of 11th Avenue and West 34th Street. Design of the 51-story, 780-foot tower is led by Kohn Pedersen Fox with Kevin Roche John Dinkeloo and Associates. The tower's massing features a tenth floor setback that affords an outdoor terrace with views of the larger development as well as Hudson Park and the High Line. On the exterior, the curtain wall features black metal mullion caps that create a grid of chamfered rectangles. West facade of 55 Hudson Yards. 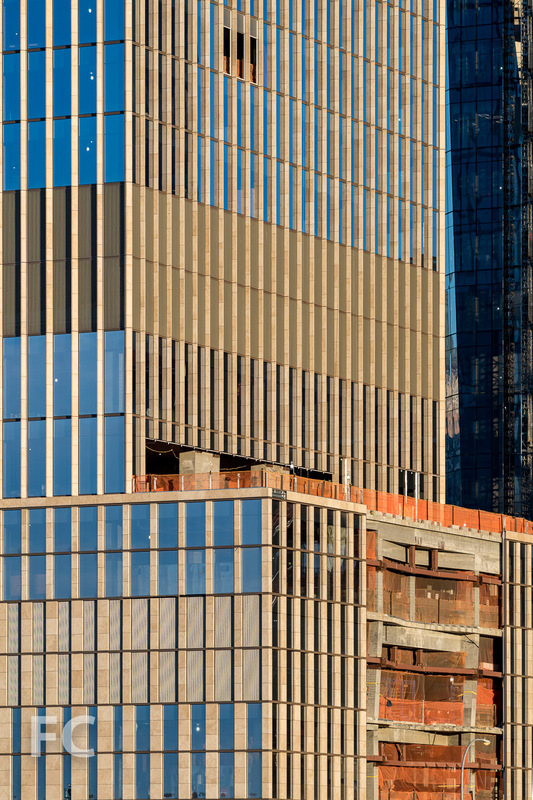 Close-up of the west facade at 55 Hudson Yards. 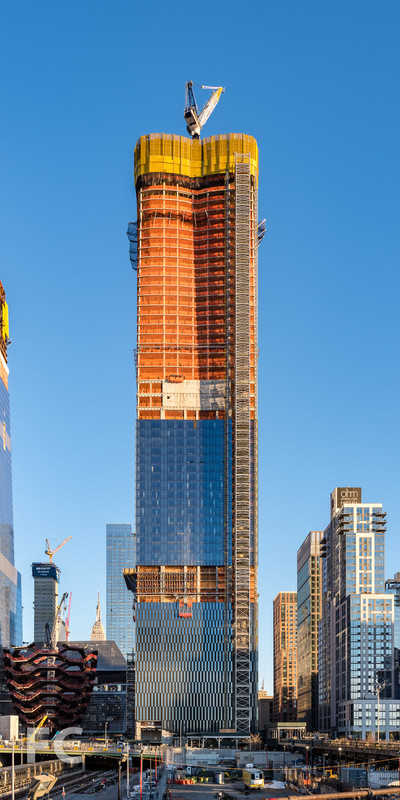 Northeast corner of 35 Hudson Yards (left) and 55 Hudson Yards (right). Architects: KPF (10 Hudson Yards, 30 Hudson Yards, 55 Hudson Yards, Retail), Diller Scofidio + Renfro in collaboration with Rockwell Group (15 Hudson Yards, The Shed), Ismael Leyva Architects (15 Hudson Yards - Architect of Record), KRJDA (55 Hudson Yards); Developers: Related Companies, Oxford Properties Group; Program: Office, Retail; Location: Hudson Yards, New York, NY; Completion: 2016 (10 Hudson Yards), 2018 (15 Hudson Yards, 35 Hudson Yards, 55 Hudson Yards, Retail, Public Square), 2019 (30 Hudson Yards).